We have added functionality and made a small change to the interface of the user profile section menus. 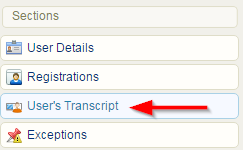 Site Managers may now access user transcripts directly from the user profile page. Systems that have this feature enabled will see a new Sections menu item within the User Profile. »» If you'd like transcripts enabled for Site Manager accounts, please enter a SRS ticket to make the request. Minimizes real estate by consolidating resets for Evaluations and Questionnaires. Creates a more intuitive way to use the reset feature. The abilty to reset a SCORM asset is now available to Site Managers. Systems that have this feature enabled will have a new Sections menu item within the User Profile. »» If you'd like this new feature for your system, please enter a SRS ticket and request that SCORM Reset be enabled.